It would have to be "eclectic." I am always trying to mix a variety of things together, to make a piece that is original, yet balanced. As a Christian, I know that my inspiration comes from the Holy Spirit, and all of my creative and artistic abilities are a gift from the Lord. I just can't get enough 4mm Swarovski bicones! I also especially like top-drilled rice pearls, 4mm "daisy" spacers, and filigree connectors. Wyandot ancestry on my father's side and a love of all things Native American by my mother, combined to give me a large interest in Native American art. 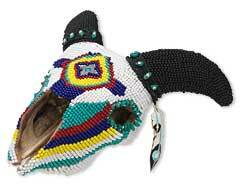 I have always been fascinated by elaborately beaded items, especially the buffalo skulls. A friend actually gave me the ram skull several years ago. It sat in a cabinet because I did not have the expertise, let alone the time, to execute what was then a very demanding project. I knew I wanted it completely covered in beads, including the horns; but did not have any idea on how to make that happen. A couple of years ago, I taught myself how to do spiral peyote, which is very satisfying to weave. So I knew that would probably work on the horns. I knew I wanted a non-bead focal, but was not sure how to bead around it. This past winter, I decided I wanted to try doing the ram skull for the seed bead competition. I did check some old Native American resources to see that my color scheme would be authentic. I started with the horns first. Each one took over 8 hours to bead. After some time wasted experimenting with beading the skull, I settled on appliquéing the beads on faux suede. I glued the focal on the center, and painstakingly beaded around it in the different colors. Originally, I was going to do the rest of it white, but decided I could not spend hours appliquéing white beads, or I'd go crazy, so I added the color bars. The whole process was very labor intensive, beading a couple of hours, taking the fabric off the hoop, fitting on the skull to check the progress, putting it back on the hoop, and beading some more. When it was "done," I trimmed the fabric, and glued it on, a section at a time. Then I used white beads to bridge the 2 seams on the back of the skull, so it looks like solid beads across the back. I added the turquoise nuggets around the eyes to dress him up a bit, as well as the braided cord, turquoise accents and enamel feathers. In all, there are about 56 hours of work in "Ram Thunders," and I think he is very handsome indeed. In my early twenties, wandering around a craft store, I came across plastic flower cone beads in multicolors with an aurora type finish and little leaf beads. I made bunches of these cute chokers, many of which were used in church fundraisers, and as vacation bible school and Girl Scout prizes. Then the company stopped producing the flower and leaf beads, and I could not find them anywhere. At that time I had not a clue that there was such a thing as a "bead shop." It was not until several years later, while on vacation, I came across a shop that specialized in beads. I did not find the little flowers or leaves then, and was not generally interested in anything else at the time; but started looking for other bead shops. After being really frustrated that no one had the glass counterpart to the plastic flower cone, I did become interested in the inventory I did see. I actually began buying small amounts of interesting looking beads for several months before I made anything. Eventually I conceded that if I was going to pursue this new found desire to collect beads, I was going to have to use some of them to make something. I also discovered the beading magazines as well. When I first started using the glass beads, around 2000, I made mostly earrings. Since then Fire Mountain has started carrying the Czech glass fower cones I had looked for years ago, so I feel I have come full circle! One of my very early memories, I was probably about 3, was of my mom making clip-on earrings from tiny clam shells and gar scales dyed in a variety of colors. As I grew older we explored a variety of crafts together, including macramé and egg art. I have had no formal training, and I have not taken any classes. My mom was my mentor. 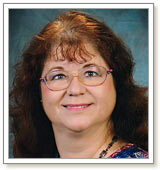 She was very active as a Girl Scout leader, and wrote and directed Bible plays for years. She was self-taught as well. She taught me how to sew, and make scenery. From 1981 to 2004 I was her chief scenery designer for plays and the many years she directed vacation bible school. When I married in 1987, my husband Ted began helping me. Between 2005 and 2009 we did scenery and costumes for another church. It was a lot of work, but very satisfying. I saw the advertisement in a beading magazine, and ordered the catalog. I spent hours with that huge book! Even though I order online, I just love browsing through the catalog and supplements. My husband and I are HUGE into flower gardening. Eliminating as much lawn as possible on our almost 1 acre lot over the last 23 years has been the goal. Accompanying my husband to train shows, antique malls, botanical gardens, flea markets, and of course, bead shops! No, I just do not have the time right now. In 2009, I retired, after 30 years in nursing. I have recently returned per diem to my specialty as a board certified oncology, and, board certified hospice and palliative care nurse, working in-patient about 2 days a week. Jewelry-making is a much needed creative outlet to de-stress and re-energize. I am desiring to develop into a full-time jewelry artist when the time is right. My business is Lavender Cat Creations. My mission statement is to create unique, beautiful, yet very affordable jewelry. My blessed husband is my business manager, making my business cards, labels and signs. We go to craft fairs, and I have people who order pieces. I am exploring online options to market my jewelry. So far, Fire Mountain is the only contest I have entered. I donate pieces to raise money for the Southern Portage County Relay for Life which is very important to me as an oncology nurse, and also because my husband is a 12 year leukemia survivor. I have also donated pieces for auctions to help patients raise money for treatment. Give yourself time to develop your creative voice. Experiment with different types of beads and findings to discover what you like working with. Practice until you perfect wrapped loops and crimping, and other necessary techniques. Strive for excellence. Wear your pieces so people will be able to see what you make. View all of Jacqueline's designs in the Gallery of Designs.